London’s Livery Companies, which today boast a membership of over 26,000, have played a big part in this weekend’s Celebrate the City festival. They’ve been selling their wares at a market outside Guildhall and many have also opened their doors to the public. But what, in the free trade driven 21st century, is the role of livery companies today? In Medieval times these guilds were a passport to trading in London. If you weren’t a member of the relevant trade you couldn’t set up in business within the City walls. They were at the same time the trade unions and professional associations of their day, regulating everything from prices, quality standards and working conditions. When members grew old they supported them with pensions and they would help spouses if their husband died. So they could be seen as forebearers of the welfare state. Many do, as we shall see, still have an important role in regulating trades and maintaining standards. For example the Goldsmiths’ Company continues to be responsible testing for the purity of gold and marking with its ‘hallmark’, the name coming from a requirement since 1478 for wares to be brought to its halls. Several hundred million articles of gold, silver and platinum are awarded hallmarks by the company each year. The Fishmongers continues to use the powers of inspection and seizure awarded in 1604 to ensure that quality is maintained on fish sold at Billingsgate Market. The Gunmakers’ Company conducts tests so that guns sold in the United Kingdom and safe to use. Livery Companies also provide apprenticeships and work placements for trainees and students, with 214 such programmes set up in the City in 2011. The Saddlers’ Company for example introduced the Modern Apprenticeship Scheme for saddlery. Think again though if you believe the Livery Companies are restricted to trades with ancient origins – there are for example the Water Conservators and Air Pilots & Air Navigators. Members continue to meet for dinners at their lavish halls across the City. These buildings, the very assets that make guilds wealthy, have been rebuilt many times over following destruction by fire and bombings. So today the halls continue to be a hive of activity through the working week. I have attended many a client presentation and drinks reception for example at these lovely buildings. The current Haberdashers Hall, near Smithfield Market, may be relatively new but it is built in a historic style, set around a charming courtyard. Today I looked around Goldsmiths’ Hall, a lavish Grade I Listed building built in 1835, the third built since 1339 on the site in Foster Lane. Unsurpisingly, gold features heavily on the ornate interiors, and chandeliers hang in the main meeting room. It really would be a spectacular place for a function. The Goldsmiths’ Company currently has an amazing exhibition, Gold: Power and Allure, on (runs until 28th July), with 4500 years of gold treasures from across Britain on display. Cabinet after cabinet is filled with luxurious pieces on display, ranging from trophies produced for sporting events and pendants to bowls and coins. 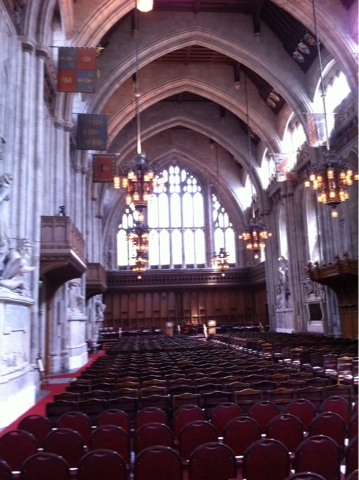 Guildhall, an amazing building stretching back to the 1400s and home to the City of London Corporation, was also open today to the public today. Local government developed here and has been a blueprint for how other towns and cities around the UK were run. It is here that the different Livery companies come to elect a Lord Mayor for the following year. The main meeting hall (pictured below) is, I believe, as spectacular as Westminster Hall and boasts lovely high vaulted ceilings and a timber roof. While some of the modern extensions to the Medieval building are ghastly, the wings do hold some spectacular treasures and documents stretching back one thousand years. Today, I was also able to view Shakespeare’s first folio and a property deed with his signature on it. So much of the City of London is hidden away and closed to the public. But keep an eye out on their websites for when they are open. Through visiting the places likes the halls of the Livery Companies and the Guildhall, you will be greatly rewarded with a memorable journey back into the past. London is a city that is always changing, somethings remain re-freshingly remain constant.